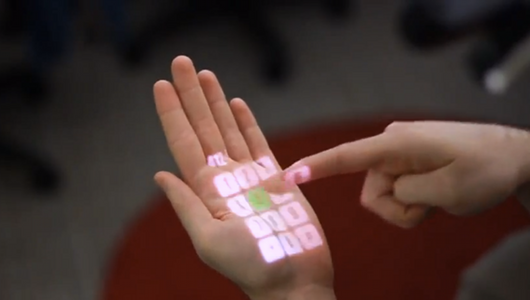 This innovative technology projects a touchscreen on hands, cloths or any other surface. This is very handy when you don’t want to bother about attending the phone call from the device in the pocket. This imagination is bearing the fruits of reality with the use of realization of an innovative Kinetic like technology also known as OmniTouch. OmniTouch is a wearable system that is capable of projecting any multi-touch interface on everyday surfaces. The technology does not require any special addition for changing it on other surfaces. It adapts convincingly to surfaces of most textures in 3D space. It works equally in better way on uneven surfaces like hands or a tree trunk. The technology includes a shoulder-mounted depth camera and a Pico-projector. The technology is developed by researchers at Microsoft. The dragging performance and touch accuracy of the technology even has reached to the sensitiveness of touch screens phones and tablets. The technology also helps to modify the position and size of the projected interface irrespective of size and surface of the smart phone or tablet. However, Omni Touch, itself can select the best display setting. And variable and various prototypes of the technology are still under research.